Nissen Angus is located in North Central Montana. We are a family owned and operated business whose goal is to raise a quality product that offers our customers outstanding performance and adds to their bottom line. Our cattle are brought up in a realistic environment. They are not pampered or influenced by optimal conditions and they are run as any commercial herd would be. Our annual production sale is the first Wednesday in April. We look forward to and work towards this day all year long. It is our chance to showcase our product, greet old friends and meet new ones. We thank you for your interest and invite you to stop by and see our cattle anytime. Our annual production sale is held the first Wednesday in April in Chinook, MT. This year’s crop features calves out of S Foundation 514, Ellingson Drover 6034, TLC Copywright 358, Hilltop Final Option 5297 and more. Jeff’s involvement in the registered Angus business started in the early 1990s when his dad gave him the pick of a couple heifers. From those heifers, Jeff grew his cow numbers throughout the years to build the foundation of our herd today. We strive to raise functional cattle with muscle and maternal strength that are easy fleshing and easy calving. We also place a lot of importance on structural correctness, carcass traits and good dispositions. Our annual production sale is held the first Wednesday in April at the Blaine County Fairgrounds in Chinook, MT. This year’s crop features calves out of S Foundation 514, Ellingson Drover 6034, TLC Copywright 358, Hilltop Final Option 5297 and more. Our 2019 sale will be our last offering of fall born bulls. We made the decision to discontinue our fall calving program so we could focus our full attention on our spring calving herd. 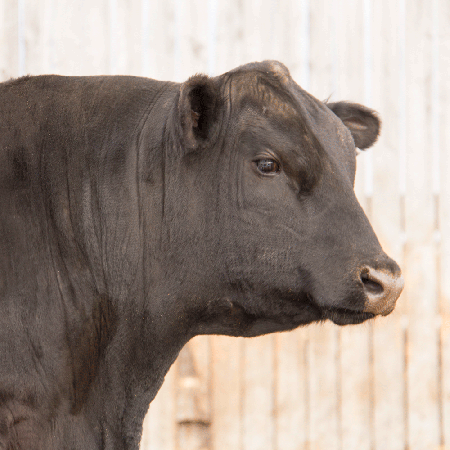 Our herd traces back to reputable programs that include Sitz Angus, Flesch Angus, Stevenson’s Diamond Dot, KG Ranch, Basin Angus, Gartner-Denowh Angus, and Rishel Angus. In the last few years, we’ve incorporated more of the foundation style bloodlines into our herd with sires like SAV Registry 2831 and SAV Recharge 3436. We’ve been really happy with how the progeny from those sires has performed. This year’s crop features calves out of S Foundation 514, Ellingson Drover 6034, TLC Copywright 358, Hilltop Final Option 5297 and more!